This week social media informed us of Tim Duncan’s decision to retire from playing in the NBA after 19 seasons. 19 seasons in which Duncan accomplished practically everything there is to accomplish in the game. With 5 NBA Championships and 2 Most Valuable Player Awards, Duncan’s spot in the Hall Of Fame has long been cleared. The fact that Tim Duncan left the game didn’t surprise me and the way that he did it surprised me even less.There will be no farewell circus like Kobe Bryant had,nor will there be a press conference with family all around. Duncan won’t even have a final on camera interview with his favorite local tv sports reporter, it’s simply not his style. 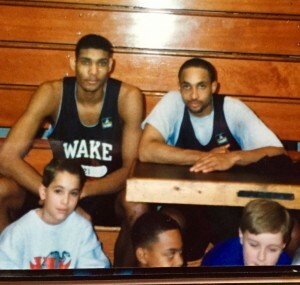 Duncan is leaving in pretty much the same manner that he arrived at Wake Forest University in 1993. I was working at WFMY-TV in Greensboro during that time, covering sports at Duke, North Carolina , NC State, and Wake Forest. Each year we saw some of the nation’s top high school basketball talent makes it’s way to the heart of the ACC. With the departure of Rodney Rogers to the NBA, Coach Dave Odom needed to fill a void in his lineup for the 1993-94 season and had plans to red shirt the lanky freshman from the Virgin Islands. Duncan’s arrival in Winston-Salem was barely noticed, after all the Virgin Islands is not known for being a basketball hotspot. Odom received a tip from a former player that there was a kid with talent on the island and that he should go to visit him. Now, as I remember, flights out of Piedmont Triad Airport were kind of pricey and most folks I knew would drive to Charlotte in search of a cheaper air fare. I have no idea how much Dave Odom spent on the ticket, but it ended up being worth every penny. As a child Duncan showed talent as a swimmer . There was so much talent that he was set on a course that could one day land him a spot on the olympic team. But when Hurricane Hugo struck the island, the only olympic sized pool was washed away and with it Tim Duncan’s olympic dreams. Tim turned his attention to basketball and found a perfect fit at Wake Forest. While the kid from the Virgin Islands settled into the school with an enrollment of around 6 thousand students , 90 minutes away at Chapel Hill, North Carolina welcomed Rasheed Wallace. Wallace was a highly touted and highly recruited high school phenom who’s arrival gave the Tar Heel faithful hope for another national championship run. Remember this was during the time of Duke’s run of 4 national titles in 5 years, but for me the most entertaining match up to watch was UNC-Wake Forest. Duncan and Wallace were the big mans battle to watch and their personalities were total opposites. To say that Rasheed Wallace wore his emotions on his sleeves would be a gross understatement. Now that I think about it, he might actually have worn them on his forehead. If his play was good or bad, most times Wallace’s reaction would let you know. This was not the case for Tim Duncan, who managed to master a talent that so many athletes wish for but seldom achieve. 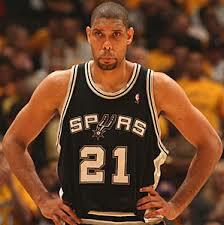 Long before he became the ” Big Fundamental”, Duncan was the man behind “The Mask”. He found a way to gather his emotions and send them to a place where no one could ever find them. It seemed that it didn’t matter if Duncan made a spectacular block or missed a shot at point blank range, the mask wasn’t going to let you in. It was that ability that would infuriate Rasheed Wallace who would have melt downs that seemed to drive Dean Smith nuts.Those nights on tobacco road with the Duncan-Wallace wars were great entertainment. Although he was raw as a freshman, Tim Duncan showed that he was a natural shot blocker and not a shot slapper. While the slapper gets a great reaction from the crowd when he sends a shot into the 5th row, Duncan knew how to stop the shot’s forward progress,and gather the ball in. At 6-11 , Duncan’s shot blocking ability alone would have allowed him to go the the NBA after his freshman year. In today’s world of one and done, Duncan would have been an easy lottery pick after year one. But leaving early was never a possibility with Duncan, who lost his mother to cancer when he was 14 years old. Duncan was honoring his mother’s wish for him to earn a college degree. Maybe I read him wrong, but it seemed that Duncan actually enjoyed being a college student-athlete. The basketball team was a hot ticket in Winston-Salem in those days. The Demon Deacons won back to back ACC tournament titles and they suddenly became rock stars. Wrestling came to the Lawrence Joel Coliseum one evening and Tim Duncan and his teammates walked into the joint to a big round of applause. After ward they team got to meet Rick Flair and invited him to be special guest coach for one of their games. Sure enough Rick Flair showed up at the game, and while the NCAA would not allow him to actually sit on the bench they found a stool for the “Nature Boy” to sit on right behind the team. When do you know that you’ve arrived ? The young Tim Duncan wasn’t the greatest interview. He didn’t dislike the media, it just wasn’t his favorite thing to do. Tim actually had a dry sense of humor and loved to see if he could catch us off guard with a brief but witty remark. He would tire of answering the same questions all the time and after some games he would ask ” Can we be original tonight “. In other words,” lets come up with a different way to start this conversation”. I wonder how he dealt with the new generation of sports reporter who seem to start all their interviews with the same : What goes through your mind ? Maybe it was just another thing that made Tim realize that it was time to go. I’m so glad that I got to know that kid from the Virgin Islands with the stoic face that would short circuit the ever emotional Rasheed Wallace.The guy who was in no hurry to reach the bright lights and big bucks of the NBA, but would rather spend a spring afternoon sitting in the bleachers wearing a straw hat and rooting for the Wake Forest baseball team. I believe that if he had it to do all over again, he would still land in Winston-Salem and would stay all four years. Now that his NBA career is done and his legacy is set it will be interesting to see what Duncan does next.Playing in the NBA for 19 seasons is a long time, but he strikes me as one of those guys who will have no trouble turning the page. One thing is for sure, he will be back in Winston-Salem from time to time and don’t be surprised if some spring afternoon there is a tall figure in the bleachers wearing a straw hat watching the Deacons play baseball.